The Mark X is the most powerful 3D printer on the market. With industrial-scale printing of incredibly strong parts and first ever precision sensing systems, the Mark X is destined to be the must-have printer for every manufacturer. 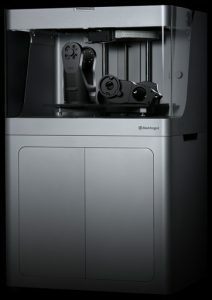 This printer combines the benefits of Markforged’s unique fiber reinforcement for parts as strong as metal with advanced “build as designed” sensors and the beautiful surface finish of Onyx. The Mark X will empower you to take any design concept and make it a reality. The large build volume of the Mark X makes it ideal for robotics, automotive parts, functional prototypes and prosthetics. 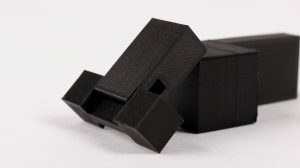 With 50 micron resolution layer height, your parts will come out of the printer with a beautiful surface finish approaching the look and feel of injection molding. The Mark X gives you breakthrough quality and precision in 3D printing. Scan your parts mid-print using our cloud-based Eiger software and a laser displacement sensor affixed to the print head. 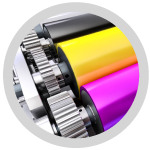 Ensure dimensional accuracy at the most critical tolerances at any point in your print. Have you ever 3D printed a part that wasn’t strong enough? The revolutionary Mark Two prints with the strength of aluminum. Now you can have the dependability of CNC parts with the flexibility of 3D printing. By reinforcing your parts with composite fiber while 3D printing them, The Mark Two achieves unparalleled strength, stiffness and durability in its printed parts. In addition to printing Nylon, the Mark Two prints materials that no other 3D printer can, like Carbon Fiber, Fiberglass and Kevlar. 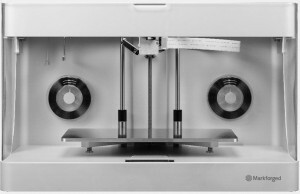 We built our own 3D printing software that comes with The Mark Two. Printing a part to be flexible or strong is easy and intuitive. Combining nylon with micro-carbon fibers, we’ve created a filament that’s not only tougher than other 3D printing plastics— it’s also stiffer, more heat tolerant, and more dimensionally stable. With the toughness of nylon, stiffness of a fiber reinforced plastic, and a heat deflection temperature of 145C, Onyx is perfectly suited for all applications that demand a high-performance material. Added micro-carbon reinforcing fiber makes for more stable parts, driving increased dimensional stability and print success rate. Onyx delivers a stunning matte black finish perfect for end use parts, meaning your designs can be taken off the build plate and put right into action without chemical or mechanical finishing. Onyx can be used alone, or further reinforced with embedded continuous carbon fiber, Kevlar, or fiberglass layers – parts truly transcending the limits of conventional 3D printed plastic. Based on our 4th generation composite 3D printing technology, the Metal X is a brand new kind of 3D printer. By printing metal powder bound in a plastic matrix, we’ve eliminated the safety risks associated with traditional metal 3D printing while enabling new features like closed-cell infill for reduced part weight and cost. Pure metal and up to 99.7% dense, the final parts are ready for use. They can be processed and treated just like any other metal parts. 17-4 stainless steel combines high strength, corrosion resistance, and hardness, making it widely used in aerospace, medical and petroleum industries. We use it for assembly fixtures and tooling on the Mark X. Also known as marine grade stainless steel, 316L stainless steel exhibits very good corrosion resistance and excellent weldability. As a general purpose aluminum, 6061 combines good machinability, strength, and weldability. It can additionally be anodized with a good finish. We use it for many of the machined components in the Mark X. 7075 Aluminum is one of the strongest aluminum alloys. With good fatigue strength and a high strength-to-weight ratio, this alloy is stronger than common structural steels (A36, 1018). We use it on the kinematic coupling in the bed of the Mark X. It’s also common in aerospace and automotive racing. A-2 tool steel is air-hardened with excellent impact resistance. We use it for punches, dies, and form tooling on the Mark X. The high carbon and chromium content of D-2 tool steel provides great hardness and abrasion resistance (but not as tough as A-2). D-2 is often used for cutting tools. Inconel’s strength combined with its impressive heat resistance makes it ideal for heat and pressure shielding applications. This Nickel-based superalloy is commonly used in jet engines and medical applications, and is very hard to machine. It is also very chemically resistant. Bearing the highest strength-to-weight ratio of any metal, Titanium 6-4 is ideal for lightweight applications and has both high tensile strength and fatigue resistance. This bio-compatible material is widely used in medical applications such as orthopedic joint replacements. No large up-front cash outlay and no large down payment due, so you get the technology without tying up your cash and credit lines. Pay for the use of the equipment while you need it, then exchange, or upgrade over time. Depending on the type of lease, monthly payments are often tax deductible or can be capitalized. Fixed payments make budget forecasting easy. It’s our business to know machines that produce large prints and we use them everyday. From the fastest and most affordable 3D printers, to the highest volume and definition — we’ve got you covered. 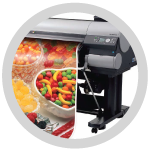 Browse through our wide selection of printing supplies we have to offer. 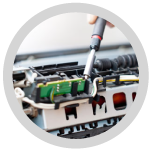 We offer equipment repair service for wide format printers, plotters, copiers and scanners. Copyright © 2019 Rapids Reproductions, Inc. All Rights Reserved. Be a part of our 3D eNews! Get great info on 3D printing, access to free webinars and other exclusive content!